Two control technologies are integrated, IEC 61499 and IEC 61131. A modern and open automation should ideally manage both standards. Many suppliers and system integrators have a rich fund of existing IEC 61131 function blocks and programs. 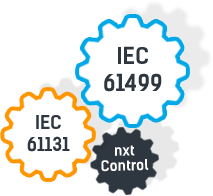 To support customers with their transition to new markets and technologies, nxtControl has developed a Hybrid solution with IEC 61499 and IEC 61131. The hybrid solution is simplified by way of the common programing languages of both norms. That way, engineers working in the home environment can take advantage of a distributed, de-centralised control topology. In a completely distributed system a pure IEC 61499 solution offers better possibilities to adapt the solution to a de-centralised hardware topology.